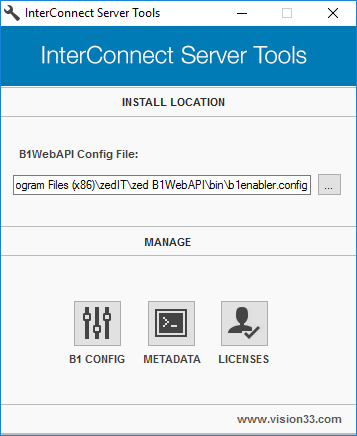 InterConnect Server Tools allows for configuration of B1WebAPI connection settings, licensing and meta-data installation. Log onto the server where InterConnect Server Tools is installed. Typically this is the SAP Business One license server. Administrator mode grants InterConnect Server Tools access to configuration files that are usually write-protected when not running as an admin. Run InterConnect Server Tools as Admin from the start menu. 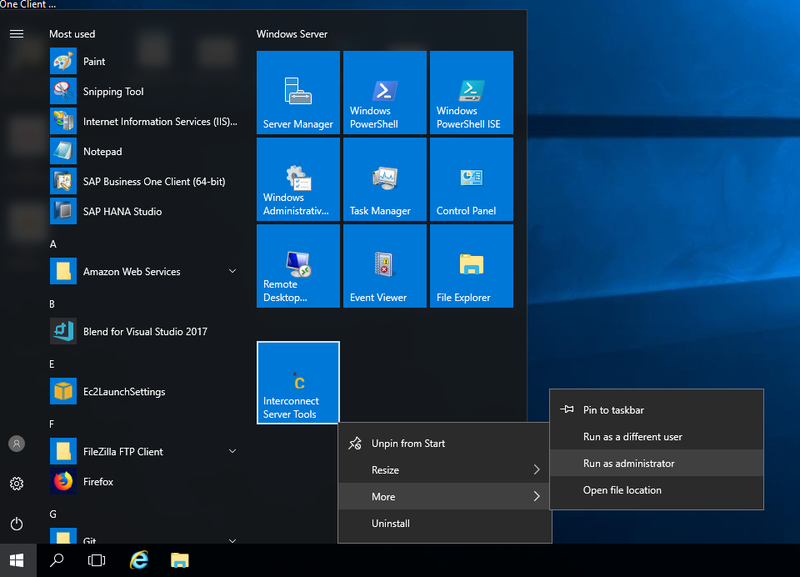 If you’ve previously started Server Tools, it will continue to run in the task bar (see marker 1 in the screenshot below) until explicitly exited. In this case, double-click on the icon for InterConnect Server Tools to open the Server Tools window. InterConnect Server Tools runs in the task bar by default. Double-click the icon (1) to open the dialogue. InterConnect Server Tools dialogue. 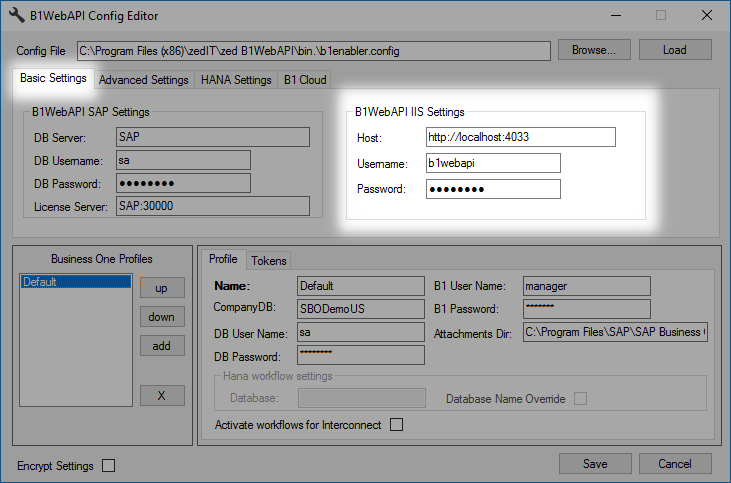 Use the B1 Config button to edit B1WebAPI details. Use the Licenses button to manage licensing. Create or update B1WebAPI profiles. Install or update customized metadata. Manage licenses and install/update standard product metadata. B1WebAPI profiles are used to maintain connection details to SAP Business One companies. 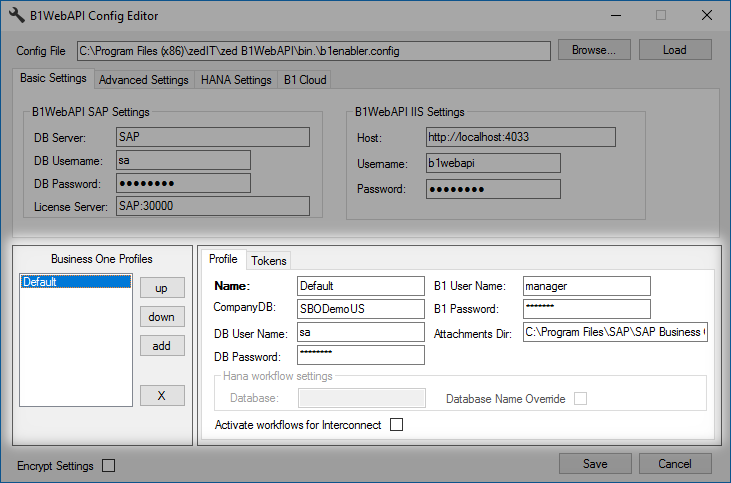 Each profile connects to one SAP Business One company, but multiple profiles can be configured within the “B1 Config” section of InterConnect Server Tools. Defines which B1WebAPI config file will be loaded and updated. Typically, this is not edited. This field is used to define where connection details are saved for the B1WebAPI. The only reason to change this value is when you require multiple versions of B1WebAPI installed on the same system. This is not recommended, speak with your InterConnect implementation consultant if you require this type of advanced setup. 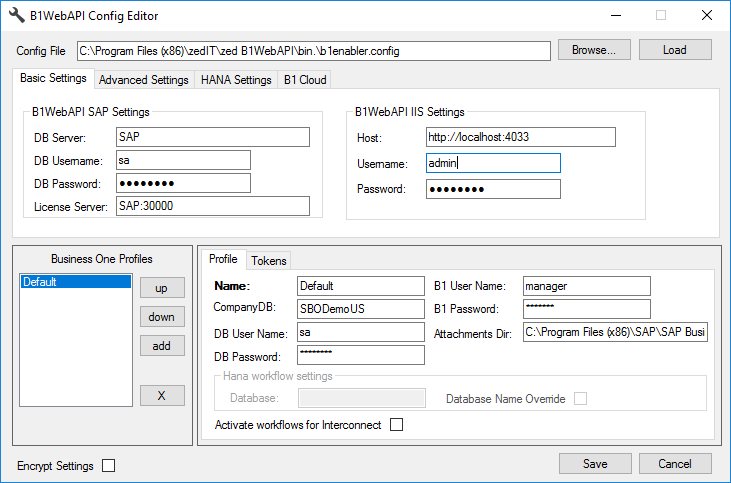 Database settings used by the B1WebAPI to connect to the SAP Business One database. In the case of Hana, this is the Linux-based Hana server connection settings. This defines the connection to the SAP Business One License Server. Defines credentials used to connect into B1WebAPI. This sets the default web address for the B1WebAPI. A different address may be set during IIS config, so ensure the same address is set in both places. If a difference exists, the IIS settings will determine where the website runs. Use this field to define the B1WebAPI user which will be used by all Portals to connect to the B1WebAPI. Good security practice is to choose a meaningful username that is not obvious (for example, B1WebAPIUser instead of just simply User. Use this field to define the B1WebAPI password which will be used by all Portals to connect into the B1WebAPI. Good security practice is to choose a long password. This section determines which profile is the default. The first profile will be used by connections that don't specify a profile. The profile with the name "Default" will only be the default profile if it's at the top of the profiles list. Use the right-hand buttons to move profiles up or down the list. Profile name, which will be used by Portals to connect into the B1WebAPI company defined in that profile. For example "production" could be used to define connection details for a live B1 company, while "test" could be used to define connection details for a testing/development B1 company. This is the SQL Database name, not the SAP Business One company name. For example, "SBODemoUS" is the database, while "OEC Computers" is the company name. 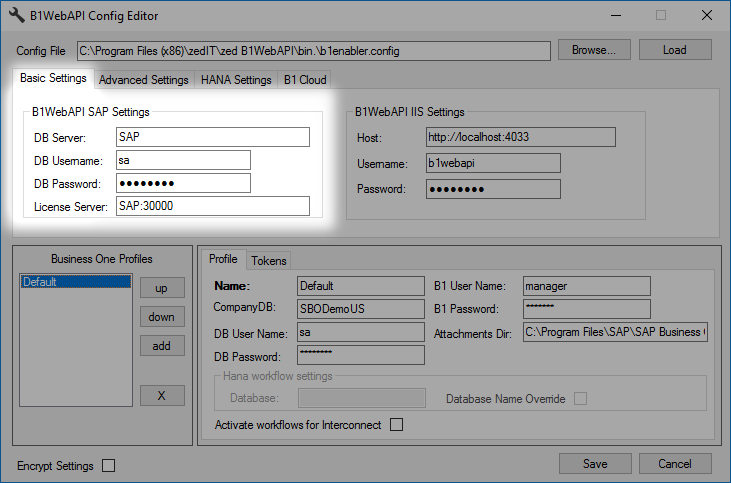 Typically these credentials are for the same DB User assigned to the SAP Business One company configuration in the section above. It's used to permit database access via the DI-API. This defines the B1 user credentials that will be assigned to the B1WebAPI. This may be an indirect user. This defines the B1 attachments directory, as set in the B1 company settings. This is used for importing Expense User attachments into B1 purchase orders. This section is used to define advanced setup options for Interconnect, including Hana installations. See Hana Settings section below. If checked, this permits this profile to use the Interconnect Workflow Service. These settings are related to file paths for attachments, temporary files, etc. This section typically remains unedited, as most installations of SAP Business One rely on the same file paths. The Attachments Directory field is the only detail you must configure for every installation. 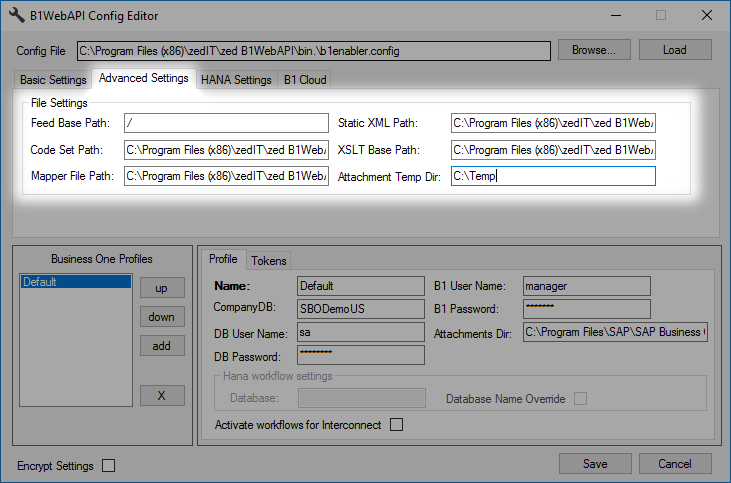 These settings are specific to Hana implementations. Do not configure for SQL Server installations. 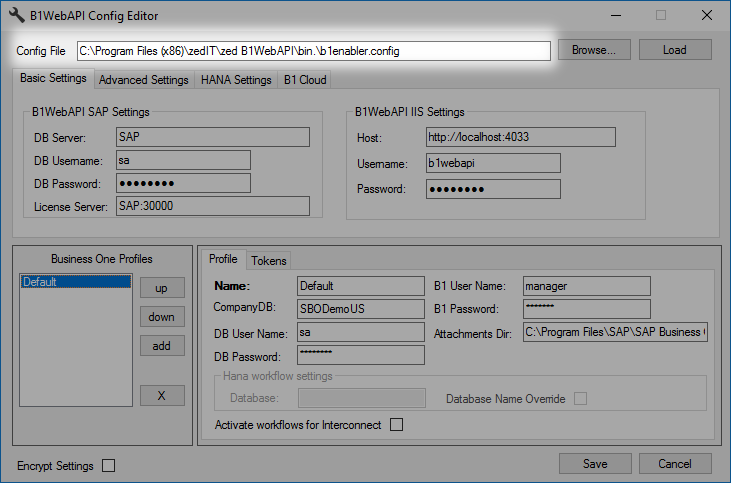 Hana only Enable this option if you are currently connecting to a Hana database. This section defines your Portal licensing, and Interconnect Workflow settings. These settings define SQL Express connection details that are used to store Portal Licensing and Interconnect workflow information. This option may be enabled to allow you to manually name the Interconnect workflow database. By default, this database name matches the Company DB name, plus \_zic. This setting is only enabled if the Database Name Override setting is enabled. If the database server password or SAP Business One password have changed, each password must be updated in every applicable profile. For example, if multiple companies all use the same SQL user, then all profiles DB Password must be updated. 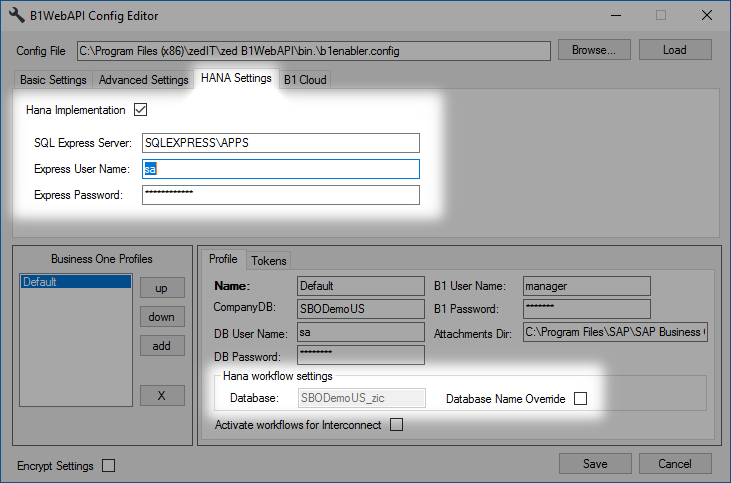 In addition to profiles, the B1WebAPI SAP Settings section (on the upper-left) should also be updated if the SQL password has changed. 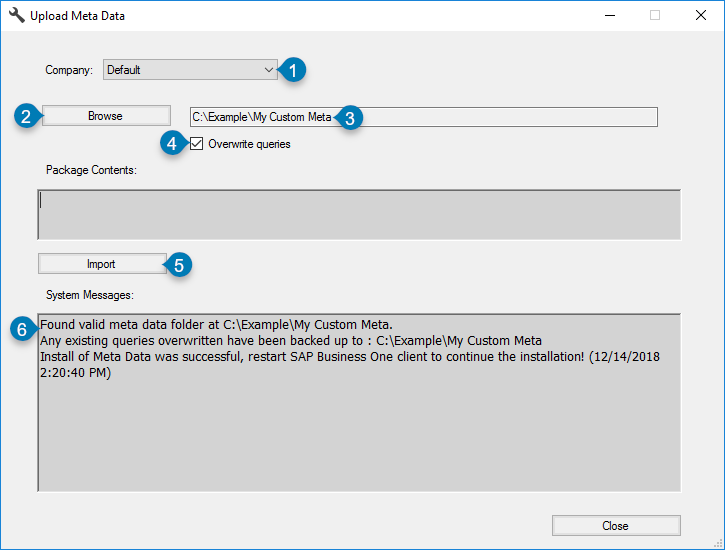 MetaData can be updated or added to SAP Business One using the MetaData button of InterConnect Server Tools. Load custom MetaData from the MetaData screen, as described below. Select a profile from the Company drop-down. Browse to the custom MetaData folder. Note that the MetaData package must include a ConfigXML folder which contains the actual MetaData files. Overwrite existing queries, if desired. The selected MetaData package can optionally overwrite existing versions of the same MetaData (for example, default Portal queries can overwrite customized versions). Import the MetaData using the Import button. Review system messages for updates to the metadata install status. Licenses can be managed from InterConnect Server Tools for both application licenses and per-user licenses. See Applying Product Licenses for a walkthrough. Manage licenses using the Licenses screen, as described below. Select a company profile. This will load that profile’s assigned licenses. Select license type, if using a development license. Production is the default. If configured, Select a user when applying per-user license modules. Assign the desired per-user licenses. Assign per-application licenses. This may prompt for metadata installation. When applying metadata, this will disrupt B1 usage for a few moments, so ensure this is scheduled ahead of time. Create a license request if new products or licenses must be added. Import License File to load a new or updated license. There are two license types Per-Application and Per-User. Per-Application licenses enable a product for use, and ensure that product’s core metadata is installed. Per-User licenses can be assigned to configured users, and enable specific functionality for the assigned user only. 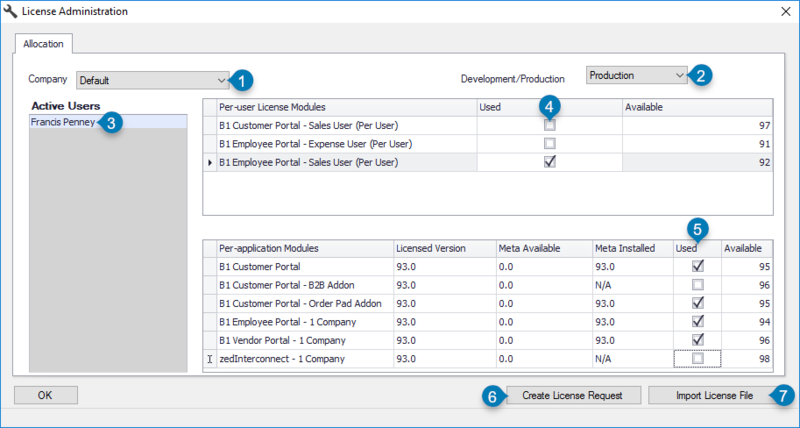 Enable product licenses in the Per-application Modules section. To do this, place a check-mark in the “Used” column for applications (marker 5 above). This will assign one Available license to the selected company profile. If applicable, a prompt will appear asking if it is okay to install MetaData. In this case, SAP Business One usage will be temporarily disrupted while the relevant MetaData is installed. Important: SAP Business One usage will be disrupted when a Per-application Module license is installed for the first time. Ensure all users are logged out of the company prior to installation of Per-application MetaData. Sample MetaData is also provided for Employee Portal. This provides additional sample roles, menu options and queries that would otherwise not be installed. These are not required for any feature functionality and may be ignored if desired. Once the per-application licenses have been applied, the number of available licenses will be decreased. Configure a user in SAP Business One, otherwise they will not be available for licensing. Restart InterConnect Server Tools if you have added any new users. The user list must be refreshed if you make changes, which requires InterConnect Server Tools to be restarted. Select the configured user from the Active Users section. Apply licenses to selected user by placing a check-mark in the Used column of the Per-user License Modules section (marker 4 above). Repeat for each user that should be licensed for that module. Once a per-user license has been applied, the total number of Available per-user licenses will be decreased.